There are many shampoos available today for treating skin problems in pets, but SulfOxyDex shampoo is something different and also has much more to offer. This is the only shampoo in the market that has a unique combination of micronized sulfur and benzoyl peroxide. Both these ingredients help in degreasing, follicular flushing and also battles against the microbial activity. In addition, it contains sodium lactate to promote hydration of the skin and coat. What is DVM Pharmaceuticals SulfOxyDex Shampoo for dogs? This topical shampoo is a powerful antimicrobial, degreasing, and antiseborrheic formulation from DVM Pharmaceuticals. It has a unique fragrance and also enhances the keratolytic and keratoplasty activity. Using this product will make your pet’s skin soft and supple. It evenly hydrates the skin and coat, thus leaving it shinier than before. 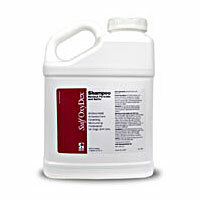 SulfOxyDex® Shampoo is a powerful antimicrobial, degreasing, and antiseborrheic formulation. It has a unique fragrance and enhances the keratolytic and keratoplasty activity. This is a great remedy for all skin problems in Cats and Dog breeds. Who should use SulfOxyDex Shampoo for dogs? This product is a great remedy for all skin problems in Cat and Dog Breeds. If your dog or cat has itch or scaling issues related to pyoderma, seborrheic dermatitis and follicular plugging then try this product. You will notice positive results with a few days of usage. Shake the shampoo bottle well before use and apply on the wet coat thoroughly. After applying, lather the shampoo on the affected areas and evenly cover the entire coat. Allow the lather to remain for 10 to 12 minutes. Rinse thoroughly afterward and use this shampoo as frequently as advised by your vet specialist. Keep this product away from children. This product is for external use only and make sure to avoid contact with the eyes. If contact occurs then flush with water thoroughly. If there is any irritation or discomfort, then discontinue the product and have a word with the vet. Avoid contact with fabrics as it may cause color fading. Keep the product at normal room temperature. This product has overall good ratings and also positive feedback from customers. The majority say that it offers positive results with consistent use. They say that it works as well as treats skin conditions without any side effects. SulfOxyDex Shampoo comes at a decent price and is available online easily. As a matter of fact, it is a great pick and there is no need for a second thought. Conclusion: SulfOxyDex Shampoo is one of the best products with effective ingredients and also gives successful results. If your pet has any skin conditions as listed in the article then definitely try this product.